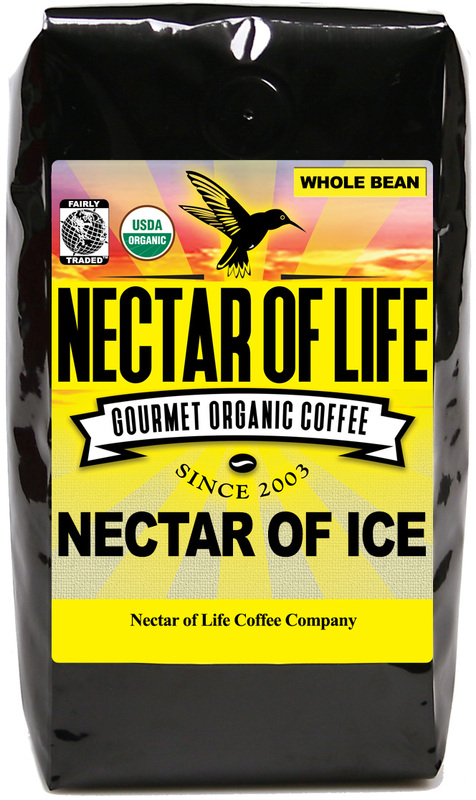 Nectar of Ice - Dark Roasted Organic Fair Trade Iced Coffee Blend and Iced Coffee Recipes. Organic Fair Trade Iced Coffee Blend. 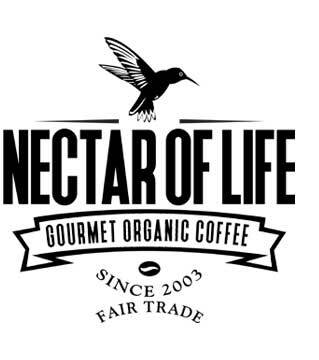 Roaster's Notes: A very full-bodied coffee with hints of berries and dark chocolate. 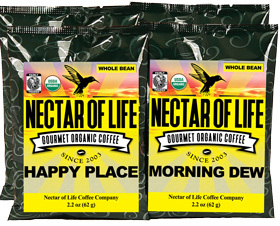 One dollar will be donated to Catholic Relief Services Fair Trade for every bag sold! We developed this blend especially for making iced coffee. 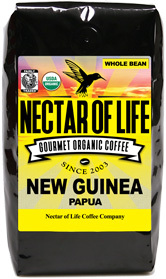 It contains the finest gourmet Arabica organic Fair Trade coffees from Africa, Indonesia and South America! This blend is roasted dark. It makes excellent espresso, or you can prepare it using our Strong Brewed Method. See below for wonderful iced coffee recipes, and Iced Coffee Preparation Tips. In a tall glass, or pitcher combine all ingredients, stir and serve. Serving/Yield: 1-16oz. serving. Fill a 16 oz. glass, or pitcher 3/4 full with ice. Add espresso (or special strong brewed), more ice if necessary, syrup, and cold water. Stir well. Stir in half & half. Combine all ingredients stir and serve. Top with whipped cream, drizzled Chocolate or Caramel syrup (or both) and chopped walnuts. Serving/Yield: 1-16 oz. Combine all ingredients and stir well to blend flavors. Serving/Yield: 1-16 oz. Combine all ingredients in a tall glass or pitcher. Top with whipped cream. Serving/Yield: 1-20 oz. Combine all ingredients stir and serve. Serving/Yield: 1-16 oz. Combine syrups and milk in a glass of ice. Pour espresso over and stir well, adding more ice as needed. Serving/Yield: 1-16 oz. Pour the condensed milk, chocolate syrup, and espresso into a 16 oz. glass and stir. Fill the glass with ice and pour in the milk. Top with whipped cream and drizzle the raspberry syrup through the middle and around the sides. Serving/Yield: 1-16 oz. In a tall glass, or pitcher combine all ingredients, stir and serve. Serving/Yield: 1-16oz. Add ice, milk, syrup and espresso to a 16 oz. glass and stir. Top with whipped cream and dust with powdered sugar. Fill 16 oz. glass about 3/4 full with ice. Add chilled coffee, milk and syrup. Stir well. Place hot water in a medium sized pitcher. Stir in finely ground Nectar of Ice coffee until dissolved. Stir in milk and syrups. Place one scoop of ice cream into each of 4 ice cream soda glasses. Pour coffee/milk mixture equally into each glass. Fill glasses almost to brim with club soda. Top with whipping cream. Place hot coffee, flavored and chocolate syrups in blender container. Blend until smooth. Cool to room temperature. Pour into a medium bowl. Add softened ice cream and cold coffee. With a rotary beater, beat until smooth. Spoon into tall glasses, and serve immediately. Place coffee, cinnamon, and nutmeg in coffee filter. Brew with the water. In small saucepan, combine brown sugar, chocolate syrup, and milk. Cook over low heat until all the sugar is dissolved. Add mixture to coffee along with vanilla. Pour into coffee cups. Garnish with whipped cream and add a sprinkling of cinnamon. Add the cinnamon before brewing for a spicy touch, not to mention the heavy dose of caramel syrup. Mix the cinnamon and the ground coffee and brew a pot of coffee as usual. Add the syrup to the hot coffee and stir until dissolved. Chill thoroughly and serve over ice, with milk or sugar. Combine everything in a blender, and blend until ice is crushed and shake is thick. Place the coffee and spices in the filter cone of your coffee maker. Brew coffee as usual; let it cool. In a tall glass, dissolve 1 or 2 teaspoons of sugar in an ounce of the coffee. Add 5-6 ice cubes and pour coffee to within about 1" of the top of the glass. For most of our recipes the ideal coffee preparation would be espresso. We know that not everyone has an espresso maker so we offer a special Strong Brew Fine Grind option with our Nectar of Ice coffee blend. Note: (if you have a fast brew coffee maker such as a Bunn read below) If you have a normal percolating coffee brewer that drips water through the coffee grounds at a slow rate this grind is perfect. When preparing your coffee use 2 tablespoons of coffee for every 4 oz of water. 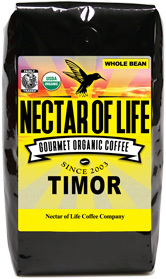 This will make an extremely strong drip brew that will make excellent iced coffee. Note: If you have a fast brewer such as a Bunn you should not use our special Strong Brew Fine Grind because the coffee grounds may overflow from the filter cone. If you have a fast brew machine either use regular drip grind coffee (and lots of it! ), or you can buy our special Strong Brew Fine Grind and tie it in a coffee filter (like a tea bag) and let it steep in hot water (just under boiling) for 5+ minutes. If you use this method you will want to buy large commercial coffee filters (available at restaurant supply stores, or Costco), and use 2 tablespoons of coffee for every 4 oz of water. Using the proper coffee, water, and quantities of coffee are crucial to producing good iced coffee. We aren't currently selling chocolate syrup, but any quality chocolate syrup will do. We are currently using Hershey's chocolate syrup and it works great! Don't let your coffee drinks get watered down with plain ice cubes. Freeze some coffee ahead of time in an ice cube tray. For a fancy touch, add a couple of whole roasted coffee beans to each cube. Warn your guests though. When the cubes melt, you don't want folks choking on the loose beans. You should brew your coffee ahead of time, to give it time to cool. If you are making espresso for the recipes then brew it fresh, immediately prior to making the drink. This is a particularly nice touch if you are serving up your coffee drinks while entertaining friends. Giving your drinks a good shake-up will make them extra frothy. Not recommended for sparkling drinks with club soda. We hope you've enjoyed our Iced Coffee Recipe page, and if you have any good iced coffee recipes you would like to suggest please email us at Iced Coffee Recipe Suggestion. We love many of the coffee's roasted here but especially love the Nectar of Ice espresso. Great consistent cup! !